Hope everyone had a spooktacular Halloween!! We thought we would give you guys some information and fun facts on Aviator Sunglasses, as they are everywhere at the moment. Most people will know of the Aviator style Sunglasses that Ray Ban produce as they are a big celeb favourite and are featured in hundreds of films. So where did the orignal Aviator come from? Aviator sunglasses, or “pilot’s glasses”, were developed in 1936 by Ray Ban for pilots to protect their eyes while flying. Aviators were given their name due to their original intention of protecting an Aviators (Pilots) eyes. They were originally only designed to be worn by pilots, however one year after they were developed Ray Ban began selling the glasses to the public and they were an instant hit and still are 75 years later!! When did they start to become popular? The Aviator became popular when General Douglas MacArthur landed on the beach in the Philippines in World War II. Newspaper photographers snapped several pictures of him wearing them and so started the craze. 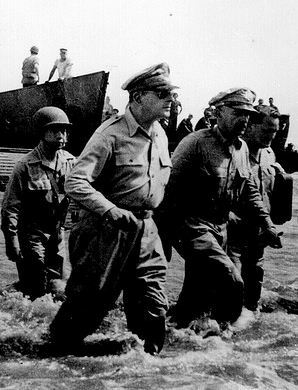 General Douglas MacArthur making the Aviator popular! When did the Aviator become Pop Culture? The aviator style began to become extremely popular in the 1960s, because of pop culture references with Michael Jackson, Paul McCartney and Ringo Starr and later they were even used by celebrities in films like ‘Top Gun’, and ‘To Live and Die in La’. Today the Aviator style of Sunglasses can been everywhere, whether it’s spotted on a celeb or in a film, the trend will certainly not be dying down anytime soon. Most Sunglass brands now have their own version of the aviator although Ray Ban is and will always be the most iconic. To name a few check out Oakley’s style on the Oakley Jupiter, Oakley Felon and Oakley Plantiff, or Gucci’s 1951 Aviator and Dior’s Chicago 2, there is plenty of choice. Keep history and fashion going for another 75 years grab your own pair of aviators! 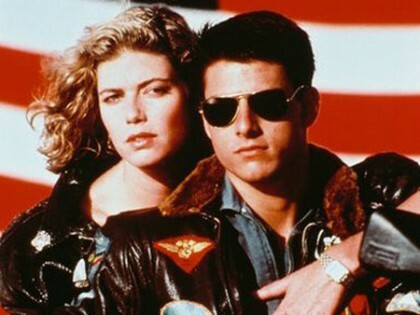 This entry was posted in Ray Ban, Style and Trends and tagged Aviator, Michael Jackson, Outlet-Sunglasses, Ray Ban, Top Gun. Bookmark the permalink.